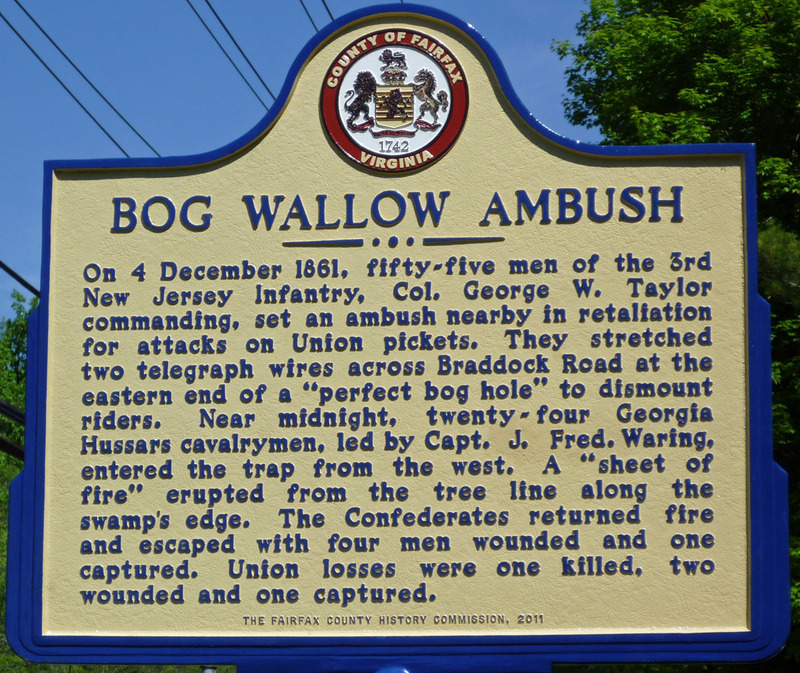 “Historical Marker: Bog Wallow Ambush,” braddockheritage.org/, accessed April 24, 2019, http://braddockheritage.org/items/show/257. The historical marker reads: "BOG WALLOW AMBUSH...On 4 December 1861, fifty-five men of the 3rd New Jersey Infantry, Col. George W. Taylor commanding, set an ambush nearby in retaliation for attacks on Union pickets. They stretched two telegraph wires across Braddock Road at the eastern end of a “perfect bog hole” to dismount riders. Near midnight, twenty-four Georgia Hussars cavalrymen, led by Capt. J. Fred. Waring, entered the trap from the west. A “sheet of fire” erupted from the tree line along the swamp's edge. The Confederates returned fire and escaped with four men wounded and one captured. Union losses were one killed, two wounded and one captured." The marker is located at the intersection of Braddock Road and Dunleigh Drive. It commemorates the early Civil War action that occurred a short distance eastward on Braddock Road approaching Rolling Road. A spring-fed pond on the south side of the road is evidence of the water source that would have produced the swamp-like conditions.